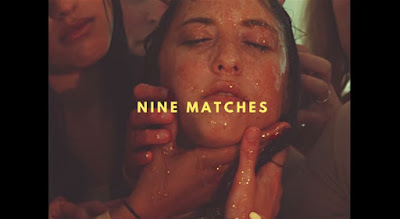 American Pancake: B Miles- Shines Darkly in "Nine Matches" and "Shaking Hands"
B Miles- Shines Darkly in "Nine Matches" and "Shaking Hands"
The imagery on B Miles' "Nine Matches" is artsy, strange, random and nostalgic. Shot in that kind of 70's ish "It Follows" meets Abercrombie and Fitch- it looks cool and feels cold. The song is a bit dark and sad really as if the emotions are at arms length but on purpose. For whatever reason I thought of Lorde and Sia. In the quieter spots, Miles vocal performance doesn't feel like one and that is what is so captivating. She sings in an inward, introspective way as if she is dealing with her stuff, her baggage aloud and we just happen to be listening. I keep pushing play again and again. Now, on her Soundcloud page, the song "Shaking Hands" does feel more performancey (is that a word?). She positions her self in R and B / light jazz styles / indie pop flavors. I thought of Adele and even the Neighbourhood. Between the two, songs I suppose if I had to pick then "Nine Matches" appeals to me more. In any event, I am intrigued and look forward to more B Miles and her beautiful voice. Best Coast share Video for "Feeling Ok"